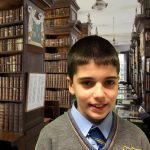 In Drimnagh Castle we enjoy reading books in our school. There are plenty of books to read. In 2nd and 6th class they do paired reading when they read a book with their parents at home for homework for 15 minutes. In every classroom there is a small library at the back of the class with a selection of books for the pupils to read. On Monday the mobile library comes for 4th and 5th to get a book from the library if they have a library card. I interviewed Ms O Connor and she is big on reading and she said she would like it if boys go to their local libraries more often. She said the librarians will help you renew a book. Some boys from different classes are going to write book reviews every month on the blog about books they read.